Now you can discover new maps, mods and texture packs whether your are at home or on the move! Mark your favorites so you can easily access them from MCModKit on your PC! Check out the new mods for version 1.9! Many more are on the way! Since we deployed ModKits on Monday, MCModKit has been growing very quickly and now receives so much traffic that our hosing provider is occassionaly throttling us. Unfortunately, this means a bad experience for our users. As such, we are in the process of relocating MCModKit to a place where it will be available on a more reliable basis. Please be patient with us while we work on this over the next week or so. Thank you for supporting MCModKit and helping spread the word! Now go play some ModKits! Check back often as more ModKits will be coming soon! Get ready for ModKits! They're more than just Mod Packs. They're a whole new experience! They're so much better than Mod Packs, we had to give them a new name! Come back on Monday to check out our ModKits and even create your own! Help MCModKit! Want new features!! We are applying for a small business grant of $100,000. Please go here and click the Vote Now button. We need as many votes as possible!! Do it!! That's right! MCModKit is doing for mod packs what it did for mods! MCModKit mod packs are more than just mods! They will include maps & texture packs too! These aren't the mod packs you're used to! We've been working on this for many months. There are so many good mods, maps and textures packs that complement each other so well that it creates a whole new experience of it's own. While MCModKit makes it insanely simple to install these items, we felt like it should be easier to install an entire experience! Want to play the Five Nights at Freddy's mod with the Five Nights at Freddy's Map & Five Nights at Freddy's Texture Pack? With MCModKit's mod packs you can easily download and install all of them at once! Create your own Mod Pack! Do you have a set of mods, maps and texture packs that you love to play with? Want to create a space themed mod pack? You can create your own mod pack by adding any number of mods, maps and texture packs and giving it a name! Become a hero in the community by sharing your creations with your friends! Invite your friends to play your own mod pack or download and customize the mod pack they created! ​Best of all, each mod pack you download is infinitely customizable! If you see a mod pack you like, but want to add your favorite mod, or use a different map then you can just remix it! It's easy to do! Simply add or remove any mods, maps or texture packs and make it your own then reshare it with your friends! We have updated the look of our website! You must update MCModKit in order to view the update properly. You can do this by simply closing and restarting MCModKit at which point you will be prompted to install the update. If you are having trouble, please let us know in the support area and we will fix it as soon as we can! If you have your own YouTube channel we'd love for you to talk about MCModKit! 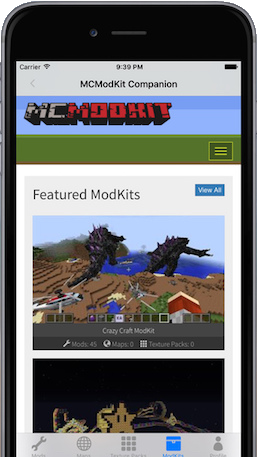 Post a video showing MCModKit in action we'll feature it on our homepage! Shoot us an email at support@mcmodkit.com with a link to your video and we'll help boost your video traffic! We hope you're loving MCModKit! Do you want to see even more mods, maps and texture packs added? How about new features such as mod packs and servers? Take a second and help us spread the word! Each new user fuels our desire to make MCModKit even better!